This Dawg's View: We're terrible on defense? I don't buy it. I'm a former University of Georgia Letterman from the Donnan Days, now working in the entertainment biz in Los Angeles. This blog began as a way to hype people into coming to view Dawg games at O'Hara's in Westwood, but has grown to be an outlet for my rants/raves about our team and the teams they play each week. I hope that any who read are somewhat informed and highly entertained by what I have to say. Enjoy. We're terrible on defense? I don't buy it. I've been reading so much CRAP about the game yesterday, that I thought I'd rewatch it and see if I had seen a different one. See, I saw us beat the #6 team in the country, perennial power LSU. But from what I'm reading, you'd think we barely squeeked by Savannah State. TE goes in motion almost to the far sideline, pulling Ramik Wilson out of the box and down to the sideline with him. The motion was mainly to find out if we were in Man or Zone. Because Ramik, and not the Corner, went out with the TE, Metts knew he had man coverage. Landry ran an inside-out route, and our Safety came down to make the tackle after the reception. Not much else he could have done since he was inside of Landry to begin with. We were in our base 3-4, sent 4 at the QB and didn't quite get there. So, LSU First down. 2nd and 7, from the UGA 48. I-Formation, 2 TEs, 1WR split right. Metts fakes the handoff, rolls right. He fires to Odell Beckham. Damian Swann hits him as the ball gets there, and it's incomplete. 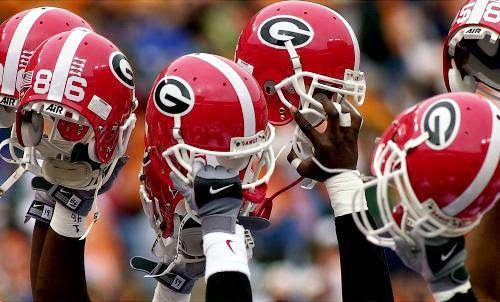 3rd and 7, from the UGA 48. We're in our Base 3-4, LSU in a shotgun pro-set with twins to the right. We send our Safety on a blitz, and Metts sees it. He knows he's gonna have single-man on his wideout (Boone), and knows where to throw the ball. Damian Swann falls as the ball gets there, LSU gets an easy score. Upon review, it looks like Swann was attempting to undercut the throw to defend it, but lost his footing. Also, our Freshman Safety didn't take the best route to Mettenberger on his blitz. He ran it a little too wide, and as a result he was just a hair late in getting to the QB. So, that's what happened on the "Oh my God, our defensive backs are so terrible!" first touchdown. Ok, I was gonna skip offense, but I thought this bared discussion. On our second Possession, on a 3rd and 10, Murray had a pass intercepted. Because Verne and Gary said something stupid in their commentary, people are talking about how Murray missed a D-Lineman dropping into coverage for the 2nd time. People are hot about Murray not recognizing the same thing that happened at Clemson. The problem is, the D-Lineman DID NOT DROP INTO COVERAGE. The D-Lineman was rushing the passer, was shutdown completely, so he did what you're supposed to do...he made space from the Center, and watched the ball. Usually, this gives you a chance to deflect a pass...this time, he was able to pick it off. But, he was not dropping into coverage. He got ridiculously lucky that Marshall was coming right behind him for a check-down throw. Oh well. 2nd and 8 from our 12. LSU is almost in a Wishbone formation. They have 2 wideouts, and three running backs. One back is set deep, as in the ACE. The other two are astride Mettenberger. I've seen this in the Pistol, but Metts is under center. Anyway, it plays into what they need...as they go Max-Protect, and send only two receivers out. Beckham, Jr runs an 8-yard stop...but it doesn't matter, because he's the 2nd read. The primary read is Landry, who runs a 5-yard in. Swann plays press coverage, but Landry makes space when he cuts. Harvey-Clemons is coming over to provide help, but because he's running toward the sideline, and Landry is cutting into the middle, he overruns it and can't make a good play on Landry. As a result, Landry gets a few extra yards down to our 3. 3rd and Goal from our 4. LSU in Empty, 3 out left - the TE is all the way outside, pulling our LB (Wilson again) out there as well. We're in a 2-4-5 with Harvey-Clemons in at Star. I can't decide if the bust here is on Shaq Wiggins misplaying the ball, or on Harvey-Clemons for turning his back and vacating space. Basically, what happens is that Harvey-Clemons hits Landry coming off the line, to disrupt his route. He then follows Landry, and has help from the safety. The problem is that because he bails out of where he was, Mettenberger has a clear path to throw the TD to Boone behind him. Now, had he NOT moved, it's quite likely Mettenberger would have hit Landry for the TD. We did have someone else there who could make a hit and possibly jar it loose...but we'll never know what woulda and coulda...only what dida happen. In that one, it's really just another great playcall. The TE pulling Ramik out of the play opened up the lane for Mettenberger to have an either-or read. 1st down at the LSU 27 Offset I-Right, Twins Right, TE left. We're in base 3-4. We bring 4, they go play-action. We have a bunch of guys at the Qb when he throws, perhaps the reason he one-hops it towards Beckham. Swann was actually the closest person to catching it, but would have had to make a hell of a play. Shotgun Pro Set Twins Right, TE left. They send a Back in motion to the left, again pulling Ramik out that direction. This time, there's no WR there to dive inside. Instead, the TE runs a drag, pulling Herrera to the middle of the field, and they isolate their TB Hill on our LB, Floyd. Now, Floyd is a hell of a player...but he's a freshman pass-rushing OLB who isn't that well-versed in coverage just yet. He is on an island, and drifts too far to the outside as Hill cuts underneath him for the catch. He gets a big first down, and is eventually cut down by Tray Matthews at the LSU 45. And then, like a Douche, Verne says "Tray Matthews made the mistake of tackling air" - of course, Tray is the one who actually tackled Hill. Eat it, Verne. Shotgun - Left, Trips right. We're in a 2-4-5, and I can only see 9 players on the screen...so two of our Safeties are playing very deep (maybe 12-15 yards). At first glance, it looks like we send 6, but we don't. We only send 4. Wilson and Herrera both have reads on the two running backs. Wilson follows his coming underneath across the middle, and Herrera drops back as his flares around the line to come to the seam. Amarlo knocks the Mettenberger-Falling-back pass away (Floyd Pressure). Leonard Floyd beats FB block, comes around and forces an awkward throw, which the TE is unable to hold onto between Wilson and Herrera. Split-backs, twins left. We're in 2-4-5 again, 2 safeties deep. Swann is up on Boone, playing bump-run. Our other two DBs on the screen have a 5-yard cushion. We rush 5, only Wilson drops into coverage, and it's basically just a mid-zone. Ray Drew gets through for the sack! They sent 3 WR out, we had 5 to cover them - Metts couldn't get rid of it before The Preacher called down the forces of Heaven on his arse. Metts drops back, pocket holds, he hits Beckham on a 10 yd stop route. He gets about 4-5 after the catch. So what happened? Looking at the coverage I see Floyd dropping into a Hook-Zone at about 5 yards. He's basically shadowing a RB in the backfield, to be ready for a flare-out. Swann is in coverage on Bekham, but It looks more like zone than man. If i had to guess, I'd say we were playing a Cover-2 Robber look, where our safety comes down and covers the middle zone, while the Corner drops deep. It's also possible that we were running a Man-Zone Cover 2, where the Corners were in man, and Swann simply overran the bailout when Bekham stopped. Either way, we made the tackle, and it's hard to place a "blame" without knowing precisely what was called. Harvey-Clemons moved over as soon as the ball was thrown, so it was a good reactionary play. 2nd and 6 from LSU 47. We drop 7 into zone coverage. Our guys put pressure on Metts, and he checks down to his RB. Floyd and Herrera combine for the tackle. 2 yard gain. Shotgun, Empty. We're in 2-4-5 again, very spread out. We rush 4. Jordan Jenkins gets a hit on Metts, but he's a touch late. Swann is in bump-run, but he doesn't get a hit on the Beckham. As a result, Beckham runs by him and makes a grab as Swann catches up. Swann makes the tackle, but Beckham gets the first. Play-Action. We rush 4 - Chris Mayes gets the sack. Metts had to hold the ball too long. Guess the receivers were covered. All of them. They send one back in motion left, to pull our backer. Herrera bumps Wilson out onto that back. We rush four. Swann in bump and run...actually presses hard on his receiver, taking him out of the play. They try to sneak a back out to the space vacated by Wilson. Mett's pass bounces off the RB. It wouldn't have mattered, as Herrera clobbered him anyway. Either Herrera recognized the same type of motion play, or Grantham made that adjustment. Either way, nice to see LSU go to what had been working and see it fail. They get a field goal. After that, we drove down and scored another TD to take a 24-17 lead at halftime. I'll take a look at the second half later. But, looking at the first half, I certainly don't see that "terrible" secondary that I've been reading about. There's a legitimate problem with Georgia's defense. It's called youth and inexperience! How many times did you see the back half of our defense confused on where to line up, who to cover and what to do? Ramik Wilson continues to get sucked into the middle in goal line situations accounting for more touchdowns. We have absolutely zero outside contain in those situations. We're four weeks into the season and Mathews and Langley are still taking fundamentally bad angles to the ball carrier. Don't even get me started on Damien Swann's performance or lack thereof! Our DBs are spending too much time looking at the QB and not paying attention to the location and patterns of the opposing WRs. That my friend is bad coaching! Now having said the above, encouraging signs are emerging. Our front seven is starting to play like junk yard Dawgs. The last two games we've given up less than 100 yards on the ground and we're beginning to get some pressure on opposing QB's, both good signs. I love the play of Chris Mayes and Toby Johnson. Garrison Smith, as expected, is having a fine year. Leonard Floyd is becoming a difference maker and JHC played his best game against LSU and will only get better. As bad as our DB play has been and IMO its been God awful, I honestly believe by the Florida game they'll have things sorted out. Chris Wilson has done a magnificent job of coaching our DL. The improvements from the Clemson to LSU games has been night and day. This is a very young D and they will make a lot of mistakes, which we knew coming into the season. They just need time, experience and some coaching-up. If this team had Joe Cox as QB, we'd be 7-5...no better off than we were then, and Grantham would be on the hot seat like Willie was. Aaron Murray is the man! I was on TV y'all!